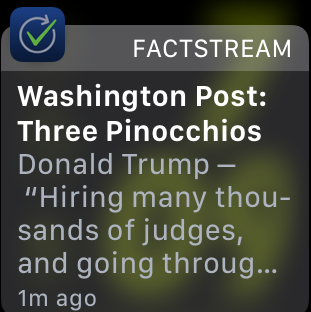 FactStream, our iPhone/iPad app, has a new feature that displays the latest fact-checks from FactCheck.org, PolitiFact and The Washington Post. FactStream was conceived as an app for live fact-checking during debates and speeches. (We had a successful beta test during the State of the Union address in January.) But our new “daily stream” makes the app valuable every day. You can check it often to get summaries of the newest fact-checks and then click through to the full articles. 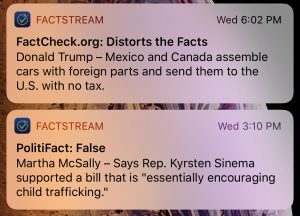 The new version of FactStream lets users get notifications of the latest fact-checks. 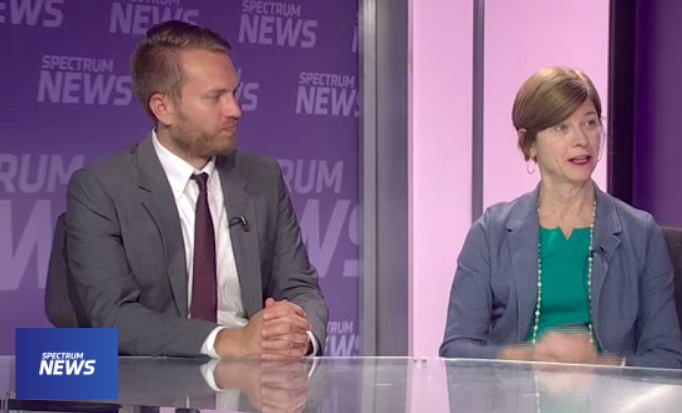 By viewing the work of the nation’s three largest fact-checkers in the same stream, you can spot trends, such as which statements and subjects are getting checked, or which politicians and organizations are getting their facts right or wrong. 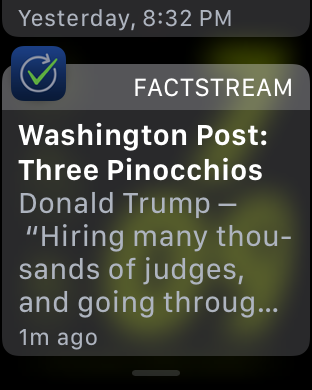 The new version of the app includes custom notifications so users can get alerts for every new fact-check or every “worst” rating, such as Four Pinocchios from Washington Post Fact Checker Glenn Kessler, a False from FactCheck.org or a False or Pants on Fire from PolitiFact. The daily stream shows the latest fact-checks. The new daily stream was suggested by Eugene Kiely, the director of FactCheck.org. The app was built by our lead technologist Christopher Guess and the Durham, N.C., design firm Registered Creative. 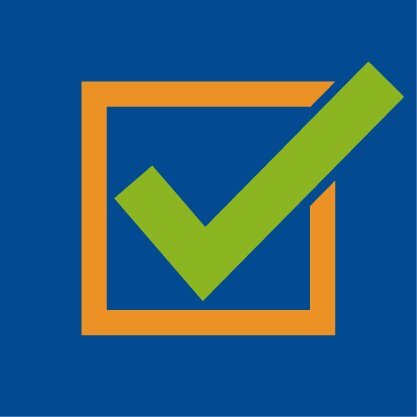 It gets the fact-check summaries from ClaimReview, our partnership with Google that has created a global tagging system for fact-checking. We plan to expand the daily stream to include other fact-checkers in the future. 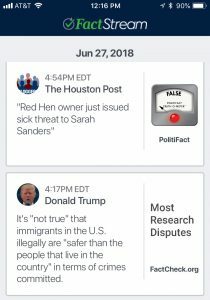 The app also allows users to search the latest fact-checks by the name of the person or group making the statement, by subject or keyword. Users can get notifications on their phones and on their Apple Watch. FactStream is part of the Duke Tech & Check Cooperative, a $1.2 million project to automate fact-checking supported by Knight Foundation, the Facebook Journalism Project and the Craig Newmark Foundation. FactStream is available as a free download from the App Store. 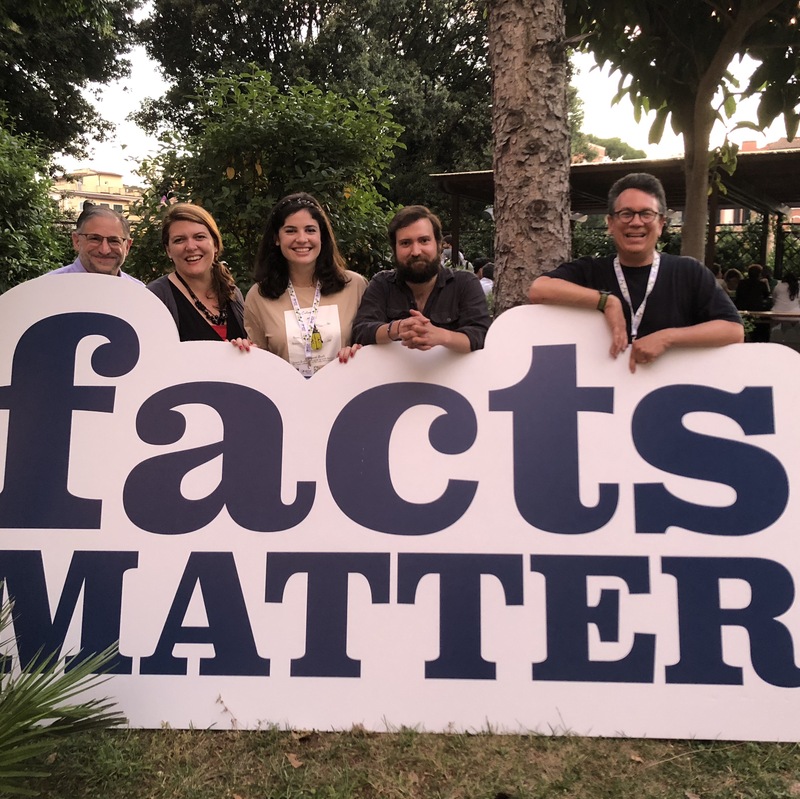 My opening remarks at Global Fact V, the fifth annual meeting of the world’s fact-checkers, organized by the International Fact-Checking Network, held June 20-22 in Rome. A couple of weeks ago, a photo from our first Global Fact showed up in my Facebook feed. Many of you will remember it: we had been all crammed into a classroom at the London School of Economics. When we went outside for a group photo, there were about 50 of us. To show how our conference has grown, I posted that photo on Twitter along with one from our 2016 conference that had almost twice as many people. I also posted a third photo that showed thousands of people gathered in front of the Vatican. I said that was our projected crowd for this conference. I rate that photo Mostly True. What all of our conferences have in common is that they are really about community. It all began in that tiny classroom at the London School of Economics when we realized that whether we were from Italy or the U.K. or Egypt, we were all in this together. We discovered that even though we hadn’t talked much before or in many cases even met, we were facing the same challenges — fundraising and finding an audience and overcoming partisanship. 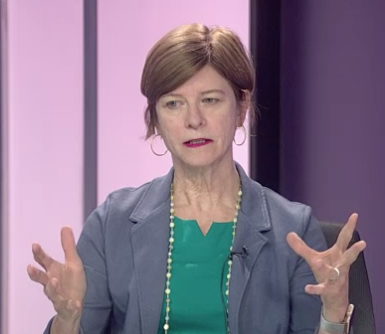 It was also a really powerful experience because we got a sense of how some fact-checkers around the world were struggling under difficult circumstances — under governments that provide little transparency, or, much worse, governments that oppress journalists and are hostile toward fact-checkers. Throughout that first London conference there was an incredible sense of community. We’d never met before, but in just a couple of days we formed strong bonds. We vowed to keep in touch and keep talking and help each other. It was an incredibly powerful experience for me. I was at a point in my career where I was trying to sort out what I would do in my new position in academia. I came back inspired and decided to start an association of fact-checkers – and hold these meetings every year. The next year we started the IFCN and Poynter generously agreed to be its home. And then we hired Alexios as the leader. Since then, there are have been two common themes. One you hear so often that it’s become my mantra: Fact-checking keeps growing. Our latest census of fact-checking in the Reporters’ Lab shows 149 active fact-checking projects and I’m glad to see that number keep going up and up. The other theme, as I noted earlier, is community. I thought I’d focus this morning on a few examples. Let’s start with Mexico, where more than 60 publishers, universities and civil society organizations have started Verificado 2018, a remarkable collaboration. It was originally focused largely on false news, but they’ve put more emphasis on fact-checking because of public demand. Daniel Funke wrote a great piece last week about how they checked a presidential debate. In Norway, an extraordinary team of rivals has come together to create Faktisk, which is Norwegian for “actually” and “factually.” It launched nearly a year ago with four of the country’s biggest news organizations — VG, Dagbladet, NRK and TV 2 – and it’s grown since then. My colleague Mark Stencel likened it to the New York Times, The Washington Post and PBS launching a fact-checking project together. At Duke, both of our big projects are possible because of the fact-checkers’ commitment to help each other. 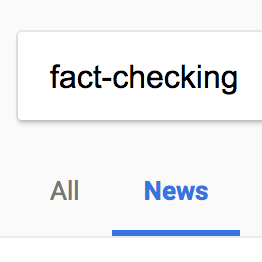 The first, Share the Facts and the creation of the ClaimReview schema, grew out of an idea from Glenn Kessler, the Washington Post Fact Checker, who suggested that Google put “fact-check” tags on search results. That idea became our Duke-Google-Schema.org collaboration that created what many of you now use so search engines can find your work. And one unintended consequence: it makes automated fact-checking more possible. It all started because of one fact-checker’s sense of community. 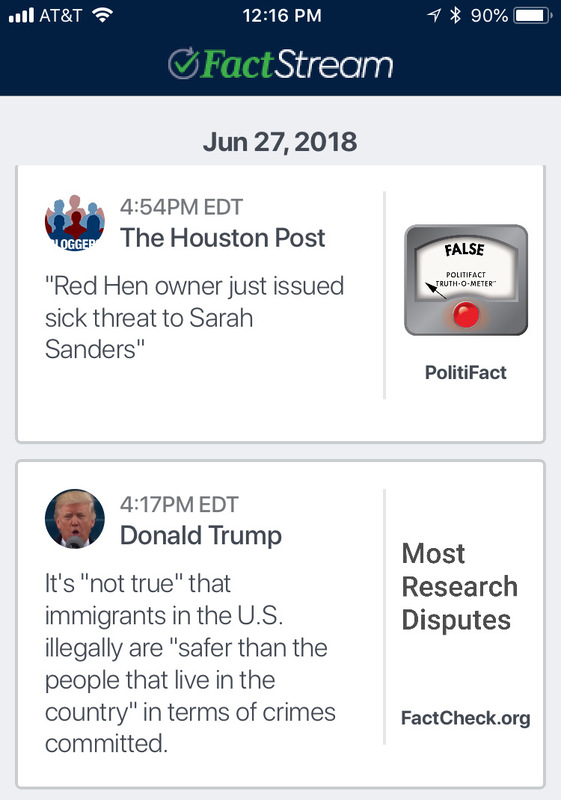 Also, FactStream, the new app of our Tech & Check Cooperative, has been a remarkable collaboration between the big US fact-checkers — the Post, FactCheck.org and PolitiFact. 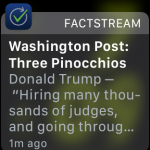 All three took part in the beta test of the first version, our live coverage of the State of the Union address back in January. Getting them together on the same app was pretty remarkable. But our new version of the app –which we’re releasing this week – is even cooler. It’s like collaboration squared, or collaboration to the second power! 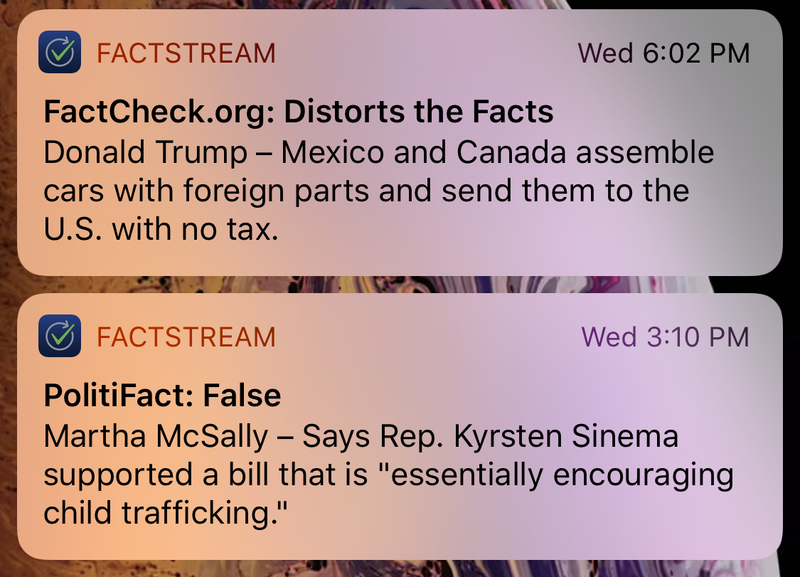 It took Glenn’s idea, which created the Share the Facts widget, and combined it with an idea from Eugene Kiely, the head of FactCheck.org, who said we should create a new feature on FactStream that shows the latest U.S. widgets every day. So that’s what we did. And you know what: it’s a great new feature that reveals new things about our political discourse. Every day, it shows the latest fact-checks in a constant stream and users can click through, driving new traffic to the fact-checking sites. I’ll talk more about it during the automated demo session on Friday. But it wouldn’t be possible if it weren’t for the commitment to collaboration and community by Glenn and Eugene. We’ve got a busy few days ahead, so let’s get on with it. There sure are a lot of you! As we know from the photographs: fact-checking keeps growing. In a sunny corner office at Duke University, four students are building bots to do tasks that are too tedious for humans. The project is part of the Duke Tech & Check Cooperative, a $1.2 million project to automate fact-checking. The students spend up to 10 hours each week in the Reporters’ Lab, a room in the Sanford School of Public Policy decorated with movie posters from All the President’s Men, Spotlight and The Post. The bots are computer programs that perform the tasks often done by college interns. The programs scour long transcripts and articles online and identify sentences that journalists might want to fact-check. The students are an eclectic bunch: a data enthusiast who guzzles nutritional drinks; a Cameron Crazy who is spending his summer solving computer science problems; a Silicon Valley resident who writes code to help animals; and a snowboarder who helps run student businesses. Asa Royal keeps track of his life in data. He tallies everything from the music he plays to the number of times he laughs at each television episode he watches. Royal, a junior from St. Louis, Missouri, joined the Lab in September 2016, the height of the last election cycle, and spent four months helping with research on trends in campaign ads. 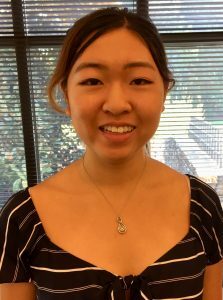 After deciding to major in computer science, Royal was tasked with figuring out how to automate the use of ClaimBuster, an algorithm developed at the University of Texas at Arlington that identifies sentences to check. His goal was to write programs that combed through dense material on the internet and submitted it to ClaimBuster without anyone having to read it. Royal built a bot that extracts content from CNN transcripts and runs it through ClaimBuster. 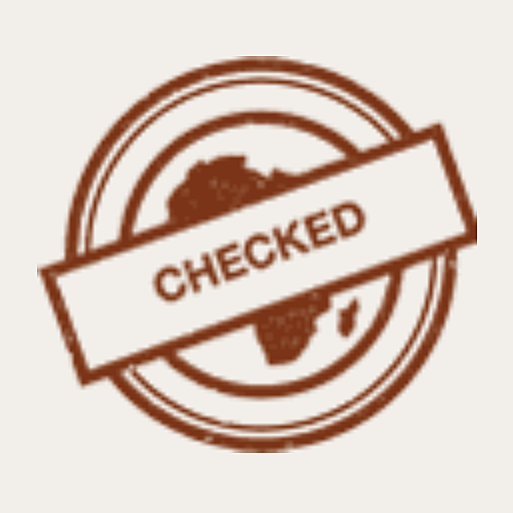 Then, it generates a daily email of 15 checkable claims that is automatically sent to journalists. Now, he also gathers content from the Congressional Record. Royal runs on Huel, a nutritionally complete powder that contains all of the proteins, carbohydrates, fats and 27 vitamins and minerals recommended for a healthy diet. When he first heard that some coders consume meal supplements so they don’t have to leave their computers, Royal decided to try it. Taking journalism courses and working at the Reporters’ Lab has changed Royal’s trajectory at Duke. Last summer, he interned at the Tampa Bay Times. After graduating, he hopes to go into computational journalism. “I realized this is what I want to code for,” he says. Lucas Fagan is a political junkie. He joined the Lab so he could have a role in fact-checking and debunking fake news, which he says are critical in politics today. Fagan, a first-year from Morristown, New Jersey, is building a bot to identify checkable claims from Facebook. The program will gather content from posts written by politicians in close races. 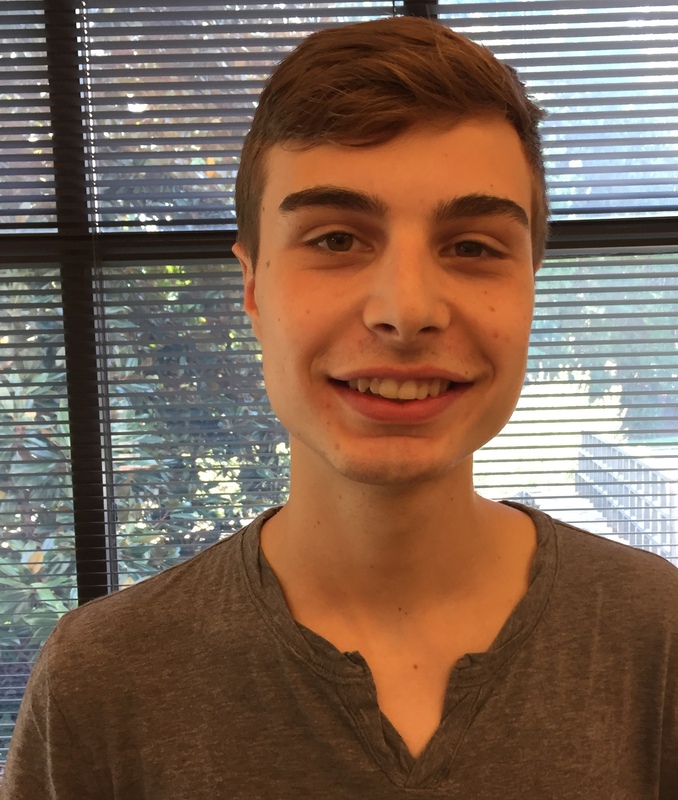 Fagan is considering majoring in computer science and mathematics. He writes for Duke Political Review and competes with the debate team. When he’s in the Lab, he enjoys playing devil’s advocate with other staff members about anything from Duke basketball to the Russia probe. 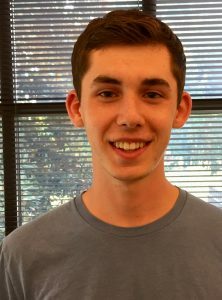 Though he enjoys interacting with other Lab students, Fagan finds he is most productive in his dorm, where he has multiple monitors set up for coding. “I honestly enjoy the work that we’re doing, so when I need a break from homework, I’ll do work for the Lab,” he says. Fagan feeds off the problem-solving involved in coding. “I enjoy trying to face the CS challenges more than anything else,” he says. 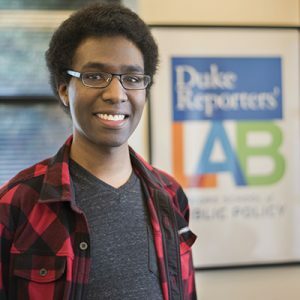 That’s why he’s staying in Durham this summer for Data and Technology for Fact-Checking, a 10-week research program through which he will tackle natural language processing and machine learning problems. 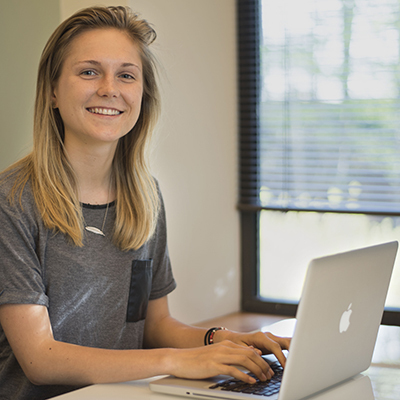 Helena Merk competes in hack-a-thons across the country, so she has ample experience designing creative tech projects. 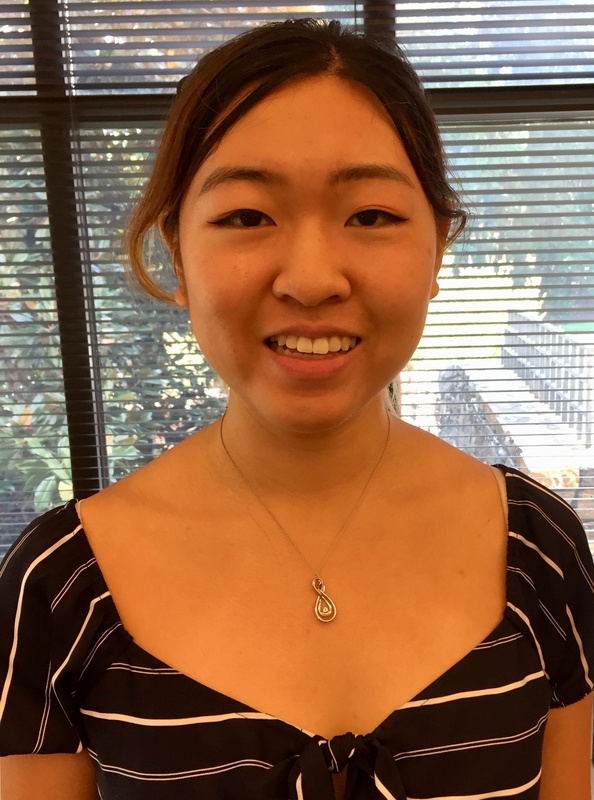 Though coding has many applications, she chooses to apply her skills to social causes. 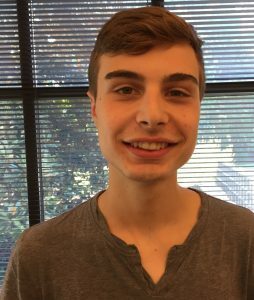 Merk, a first-year from Palo Alto, California, is writing a program that would enable the Lab to send its daily list of checkable claims through Slack, a messaging tool utilized by newsrooms. This year, Merk helped organize Duke Blueprint, a conference aiming “to inspire disruptive innovation for future-focused global change.” She also works remotely as the lead mobile app developer for AdoptMeApp, an app that connects shelter dogs with potential owners. Merk applied to the Pratt School of Engineering, planning to study biomedical engineering. 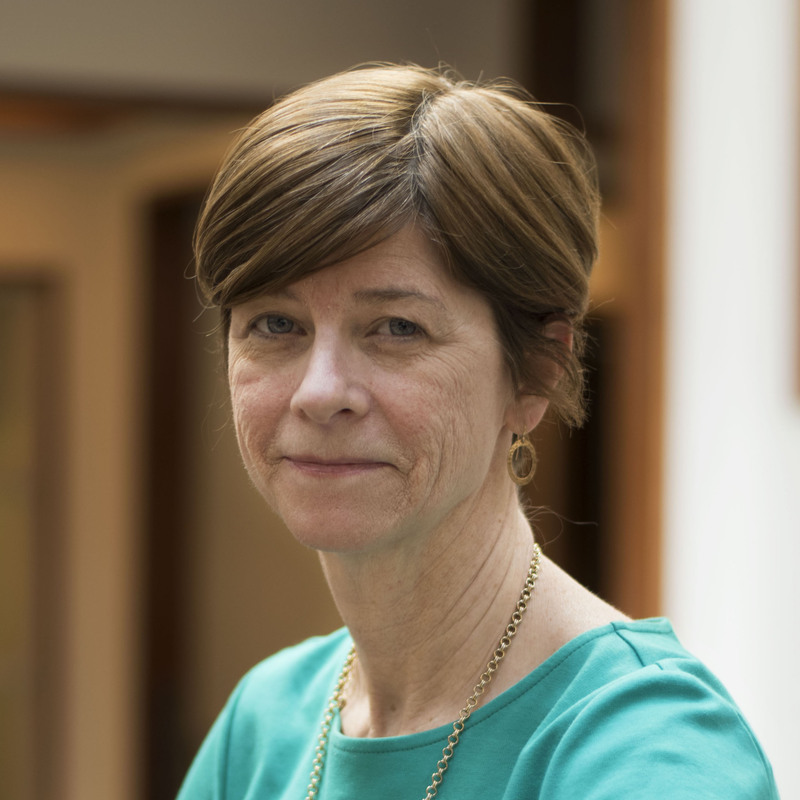 But in her first semester she realized there were other disciplines at Duke that could combine technology and health. Naman Agarwal started coding in high school while he was interning for a local politician’s campaign. After spending weeks entering donor information into a spreadsheet, he built an app to automate the process. 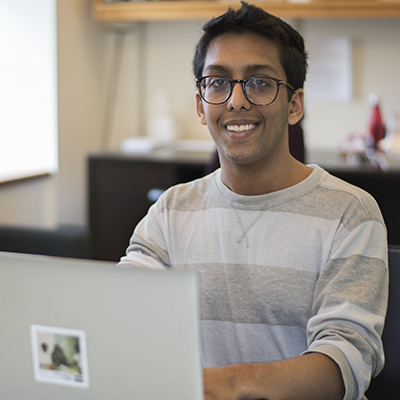 Agarwal, a first-year from Palatine, Illinois, is now building a bot for Tech & Check to identify checkable tweets from politicians in competitive races. 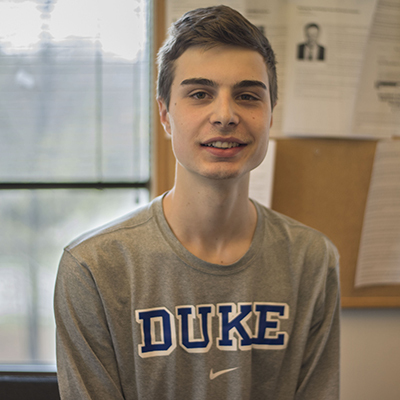 Agarwal works at Campus Enterprises, a student-run LLC that provides food delivery, custom apparel and other services to Duke students. He is also a drummer and producer for Duke’s student-run record label, Small Town Records. On the weekends, he travels to snowboarding competitions with the Duke Ski Team.